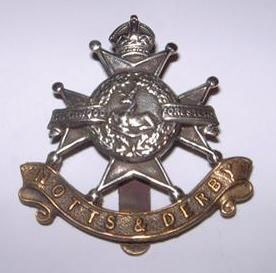 Notts & Derby Regiment (Sherwood Foresters) Cap Badge. Henry Bullimore was born in 1879 in Muston. He was the third of four sons of John Bullimore, a farm worker from Heckington, Lincolnshire, and Ann Bullimore, who came from Billingborough, also in Lincolnshire. In 1881 they lived in Muston, where there were five children: John (aged 13, already at work as a farm labourer), Mary Ann (10), Elisa (7), William (5) and Henry (1). In 1891, they were on Bridle Road, Barrowby, now with William’s grandfather, Joseph Bullimore, 69, a widower still at work as a farm labourer. The older children had left, but William, Henry (11) and Arthur were still at home. Joseph Bullimore died before the next census in 1901, by which time John and Ann had moved to Stainwith with their sons William, Henry and Arthur. Henry, 22, was now an ironstone labourer like his brother William, and Arthur worked as an agricultural labourer. Henry Bullimore married 21 year old Elizabeth Maltby, from Bottesford, in 1903. In 1911, Henry (now a quarryman) and Elizabeth were living in Muston with their three daughters Annie (aged 6), Nellie (3) and Rosalie (1). A number of medal index cards for men named Harry Bullimore have been examined. They belong to men from a variety of regiments. Perhaps the one most probably referring to the Muston man is that for Private 305369, 2/8th Battalion, Leicestershire Regiment, which provisionally adopted here pending further information. The 2/8th Battalion of the Sherwood Foresters was formed at Newark as a Territorial unit landing in France in February 1915 to become part of the 139th Brigade 46th (North Midland) Division, which fought on the Western Front for the remainder of the war. Henry Bullimore was awarded the Victory Medal and British War Medal, and also the Territorial Force War Medal (Forces War Records). However, no further details of his service record have been discovered. Henry and Elizabeth were registered as voters living at May’s Row, Muston, through the 1920s, and in 1939 they were still at this address, where Henry an ironstone quarryman and Elizabeth lived with daughter Rosalie (born on the 11th November 1909). Elizabeth Bullimore died in 1943 and was buried in Muston on the 11th November, aged 61. Henry Bullimore died in 1970 and was buried in Muston on the 3rd July, aged 91. Arthur Bullimore was the youngest of the brothers, born in 1887 and baptised at Barrowby on the 3rd April. In 1911 he lived at Stainwith, working as a farm waggoner. He was living with his widowed father, now 64 years old but still working as a farm labourer. Arthur did not marry until 1930, when his bride was Frances M. Lee. He died in Melton Mowbray in 1962, aged 75. The search for his military service record was inconclusive because of the large number of medal index cards any one of which could refer to him. It is most probable that he did join up, bearing in mind his age and that fact that as an agricultural worker he is not likely to have been exempted from the call-up. For each of the Bullimores, there are too many inconclusive pieces of information to be certain what service any of them gave. The identifications given are the best possible until more information comes to light.